The urban development project planned the destruction of one the porches to improve the accessibility of the area from/to the city centre. During Spring 2008 Le Bruit du Frigo submitted the City Council a participative project involving the inhabitants and inviting them to be actors in the reorganization of their public space. The members of the association decided to graft a wooden structure to the front of the existing building. While this grafted-on addition became the temporary Bistrot du Porche, two vacant flats in the building to which it was added were made available and used as kitchen. The menu card was designed in cooperation with women from Takapress, a socio-cultural local association. The dishes cooked in the kitchen in the flats upstairs were taken down in the restaurant with a goods lift. The bistrot now visible from the outside public space became a stimulating place where the inhabitants came to share their views and wishes on the transformation of their living environment. The very short time span of the intervention – 3 weeks only – has induced greater focus and identified a set of ideas and proposals illustrated with plans and photomontages (see pictures). The day-to-day presence of the members of the association in Le Bistrot du porche helped the inhabitants to be mobilized and participate more easily in the debates and the creation workshops. The results of this collaborative work were submitted to the architects in charge of the project so they could use the ideas that had emerged from the workshops. The urban redevelopment was carried out by the Cabinet Ruelle and completed in 2012. 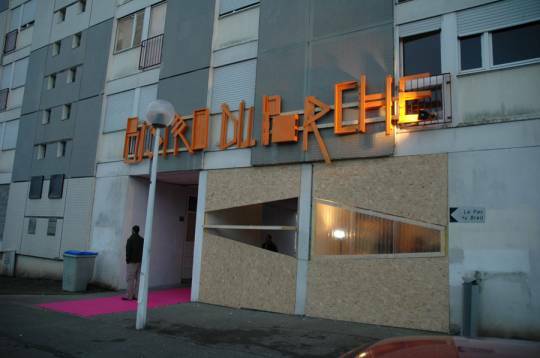 Le Bistrot du porche’s project was implemented by the Bruit du Frigo, a collective of architects, urbanists and artists. Inhabitants have been invited to discuss and imagine the future development of their urban environment. The members of the association wanted to create a convivial space with a menu card designed in cooperation with and for the locals. It can therefor be considered as a real inhabitant-centred initiative. If design is not central to the project, the participative approach to urbanism is important to be highlighted since it can be related to co-design practices.